It is easy to handle because it flying well and fly to the target area. Because the price is high, it is hard to use for practice. It is recommended for games. Power can also be steadily transmitted and you can hit a heavy smash. There is no individual difference and it is carefully made. Craftsman	It fly firmly in an obed trajectory. The goodness of flight is attractive, no matter what. It is particularly helpful to beat Rob. I do not feel something like a habit in a honest orbit. Moreover, individual differences are hardly felt. It's expensive and not very durable, so it's a good idea to keep it in a game called here. I purchase it for practice and use it. I often use Yonex's shuttle, but I often use this gothen's platinum. The shuttle's flight is very good, and the sound at the time of impact also has a good sound. Also, it is highly durable, so it can be used for a long time even in practice, so it is recommended. Rob is easy to strike, especially because the flight is very good. There is no need to worry about jumping too much because it is also easy to rotate. Easy to control, comprehensive power is a high impression. Just because it's quite expensive, it's better not to have a better durability but it's a good match. It is a shuttle that stretches well for good flight. It's expensive and it's a good idea to set aside for the game. There are almost no individual differences, so I feel I made each one firmly. Rob is also very easy to beat, I feel the height of comprehensive strength. 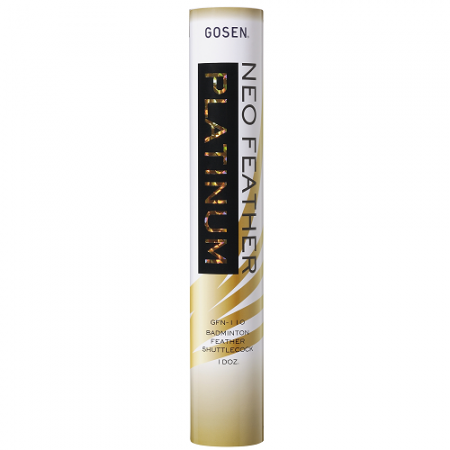 Gosen Neo Feather Platinum is the highest price among the shuttles of Goshen, and there is no quirk at all on how to fly the shuttle. I think that the player's racket work will be reflected in the rotation and orbit of the shuttle as it is. It is a very easy-to-handle shuttle that can fly in well-targeted places with good flight. It is recommended for games because there are few individual differences. The only drawback is that the price is high. Power is transmitted firmly and it is good to say that it is the finest quality item.